Super Bowl Sunday is like Christmas for all of us who love to make and eat food. An entire day of nothing but noshing, hour after hour – oh, and a football game with the best commercials of the year too. Yep, it’s a day I look forward to all year long, even if my favorite teams aren’t playing. I start planning my menu a few weeks ahead, being sure to have as much of it made in advance as possible so I don’t have to spend the entire day in the kitchen. I don’t want to miss a single minute of the festivities. I look for recipes that are simple to assemble and get on the table, dishes that will hold easily at room temperature and not spoil. If I am hosting a large crowd, I usually have about 8 dishes for variety, starting with 3 out on the table, and adding a couple new ones every hour or two. This keeps things interesting and lets my guests graze to their heart’s content. I also set up a self-serve bar so no one has to play bartender. Make sure to offer non-alcoholic beverages as well as cocktails, beer, and wine. Over the years I have made dozens of dishes, but a few are on regular rotation and today’s recipe is one of those. The first time I made this was after we returned from a trip to New Mexico. We were served a similar dish as part of an appetizer trio in a local restaurant. It knocked us out and I couldn’t wait to get home and recreate it. To make it easier, I use canned black beans, but if you have the time, cook your own beans from scratch and it will be even better! This is also a really great option to serve because it is gluten-free, dairy-free, vegetarian, and vegan. All that and so delicious, a true winner! 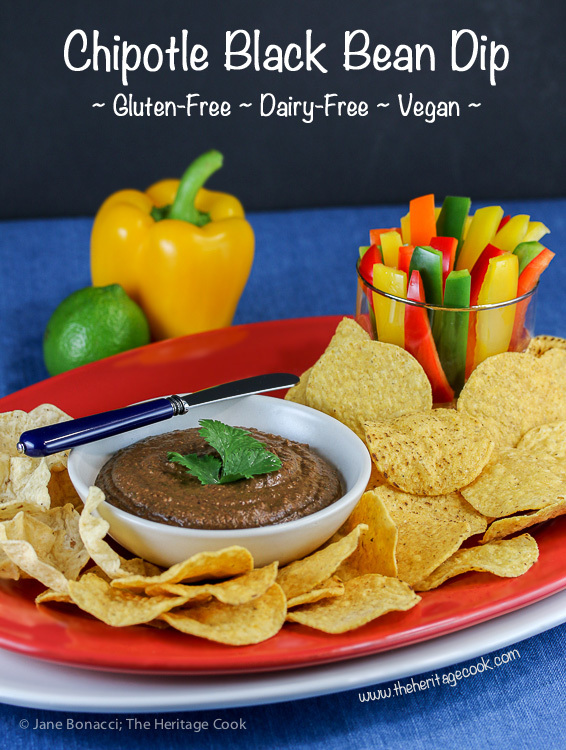 It has become one of our all time favorites and I can personally eat an entire batch of this dip all by myself with nothing but a huge bag of tortilla chips. But it is very versatile … you can use it to make Huevos Rancheros, as the base for a 7-layer dip, in vegetarian tacos, or as part of a platter of Totchos! The possibilities are nearly endless. This year I doubled the recipe and will serve it two ways. As a simple dip with chips and vegetables, and as part of a Mexican layered salad. I can’t wait!! Adding strips of lightly steamed red, yellow and green bell peppers, cauliflower florets, jicama sticks, or other crudités, makes the platter look more tempting and healthier for those on a diet. As part of Food Network’s #ComfortFoodFeast, make sure you check out all the recipes shared by all the wonderful bloggers this week. We have a plethora of dips that are perfect for your Super Bowl festivities. And to add even more fun, I’ve included links to some incredible dips created by the Sabra Tastemaker team. Don’t be surprised if you want to make every single one of them! I guarantee you will have trouble picking just one or two, LOL. I hope you have a fantastic weekend. I am rooting for Peyton, but have a feeling the Panthers will give him a heck of a battle. As always I am hoping for a great game with lots of excitement, a fabulous halftime show, and am looking forward to seeing all the commercials. Happy Super Bowl Weekend my friends!! If you microwave citrus fruits for 15 to 20 seconds, then roll them on the counter (pressing down firmly as you roll them), you will get much more juice! Always check the labels, especially on processed or prepared ingredients, such as the beans in this recipe. If you are in doubt, contact the manufacturer to be sure. In a 10-inch skillet, heat oil over medium-high heat. Add onions, oregano, cumin, and ancho chile powder to the oil. Reduce to medium and cook until onions are translucent and softened, about 3 to 5 minutes, stirring often. Add the garlic, stirring often for about 30 seconds. Remove from the heat. In the bowl of a food processor, combine the cooked onion mixture, fresh cilantro, chipotles with juice, and beans. Pulse until coarsely pureed. Add the lime juice, half of the lemon juice, sugar, salt, and pepper. Puree until very smooth, about 2 minutes, scraping the sides of the bowl often. Taste, adding more chipotle if you want it hotter, or more lemon juice if it needs balancing. Transfer puree to a serving bowl. Garnish with fresh cilantro leaves and serve. Make up to 4 days in advance; cover and keep refrigerated. Flavors meld and intensify with time. If you are making this ahead, start with the lower amount of chipotle, then taste and adjust seasonings before serving. If the dip turns out too spicy (with too much chipotle), add more beans and a little water to cool it down. You can also serve it with dollops of sour cream as well. By Jane Bonacci, The Heritage Cook © 2001. All rights reserved. This recipe is part of Food Network’s weekly Comfort Food Fest celebration. See the links below for this week’s inspiring recipes and check out our Pinterest page for even more delightful treats! I am proud to be a member of Sabra’s Tastemaker team and we have been sharing recipes all during January to make Super Bowl Sunday even more super. I was not asked to share these recipes and haven’t received any compensation for doing so. Here are 16 more dip recipes from the Tastemaker team to enjoy this weekend and all year long! I was not asked nor compensated for writing this post. As always, all opinions are my own. Let’s connect! If you ever need any entertaining or cooking advice, need to alter a recipe for gluten-free, or want recipe suggestions, don’t hesitate to email me. Thanks for joining the Heritage Cook Family! « 55 Super Appetizers for Super Bowl Sunday! This looks so good. I can imagine all the smoky flavors in one delicious bite! Thanks so much for sharing our post! Love being a part of the Sabra community.